A denture is made from hard-wearing material that mimics the look of teeth and gums to give your mouth a natural appearance. After impressions are taken, a denture is designed in a dental laboratory. 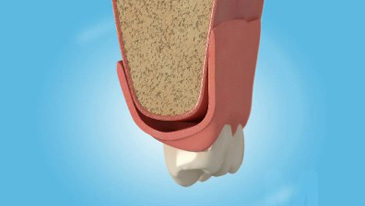 Dentures are made to fit snugly on your gums and you will be able to remove them for cleaning. When you wear a denture for the first time it may take some getting used to when speaking or eating and chewing. It is important that you take extra care when conducting your hygiene regime so that you can avoid bad breath, tooth decay and gum disease. The hygienist will be able to show you how to best take care of your denture and gums and will tell you about specialised brushes you can use to do this.